RSW- Artwork page, "The Road Home"
This drawing would be unknown to us if not for its appearance in our exhibition records. 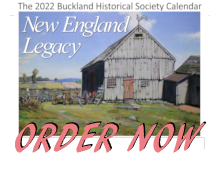 We do not know the subject matter of the drawing, however, an oil painting named The Home Road was painted the same year and we have an image as well as RSw's diary comments regarding the painting. 1944, and believed to be similar to this chalk drawing. "Painted in 1944. Long flat panel canvas made in studio winter of '44 when I was making several of that size and proportion. Designed arbitrarily from different elements I like in different past canvases. Road and Mt. from Down an August Road, old N.E. red farm house and maples from N.E. Autumn etc. Sold by Mr. Williams in the spring of 1944 to Mr. and Mrs. P.H. Murray, 89 Lawrence St., Gardner, Mass." from which the others, including this, was based. 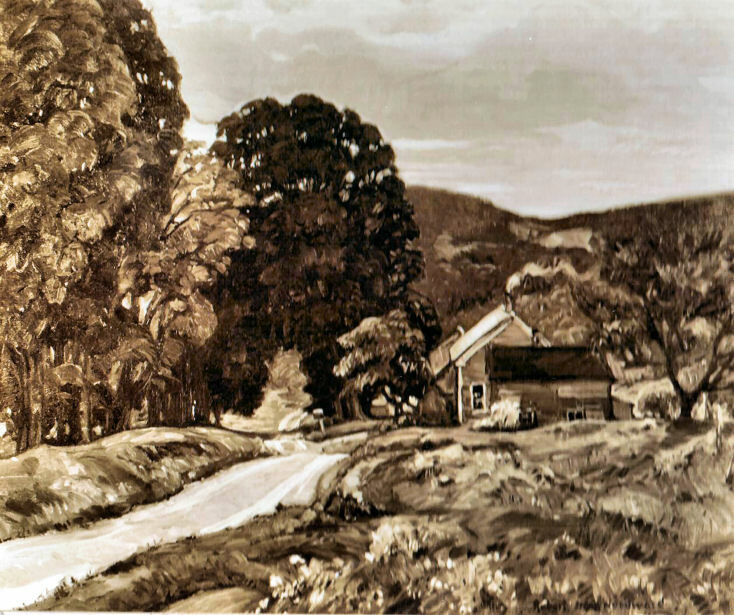 In the same year RSW made this chalk drawing , which exhibited at the home of Mr. & Mrs. Roger Smith, the painting named The Home Road was also painted. Due to this connection and the similarity in name (RSW often flipped words in a painting name and its related chalk), we believe this chalk's composition is most likely the same. We do not know the whereabouts of either artwork but do have the black and white image above. 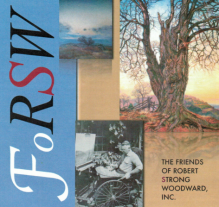 Both painting and drawing are considered composite paintings because RSW "Designed arbitrarily from different elements I like in different past canvases." 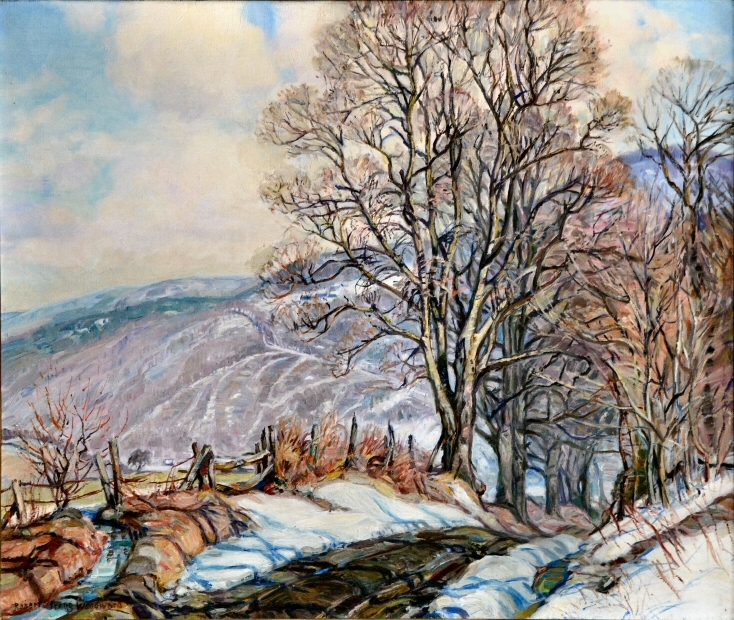 While rare in his career, he did do a number of composite paintings between 1940 and '45. 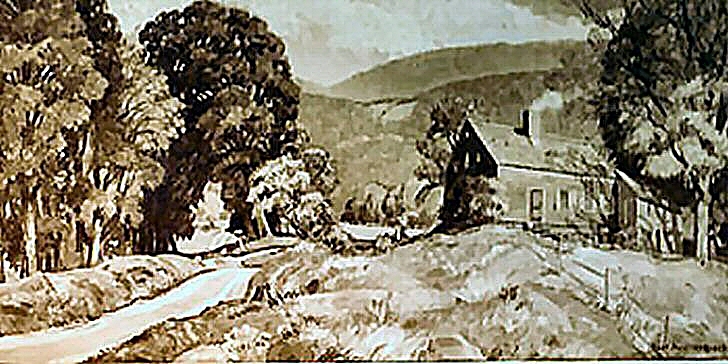 It is worth noting in regard to this drawing and other composites, the road, mountain and trees used from Down an August Road where also used in a composite RSW painted in 1939, In Early Autumn with an accompanying chalk drawing named, Early Autumn. In Early Autumn was later "cut-down" in 1950 because of an issue with competing focal points and renamed, Early Autumn confusing matters even more. None the less, all paintings but the original, including this one, are all considered composite paintings. See also Early Autumn, Chalk, to view related pieces.